My mother, Megan, is an extremely intelligent woman who often says she would like to write a crime novel. If anyone could do it, it is her. As it is, she's a busy academic who still finds time to devour at least two novels a week. These novels are usually crime novels. As I don't usually read crime, I thought perhaps it might be nice if every now and then, I got her to review something she rather liked for you all, seeing as my bias away from crime is surely not shared by all my readers. In the style of Triple J's breakfast program, in which they ask their fathers to review the feature albums, I now bring you My Mum Reviews. He’s a local cop working out of the new Fremantle police station, driving a Western Australia Police pool Commodore down familiar Leach Highway and carrying out his investigations against a backdrop of familiar local and national events. It is interesting to read a crime novel set in the city in which you live, especially when you have read many a foreign crime novel before. 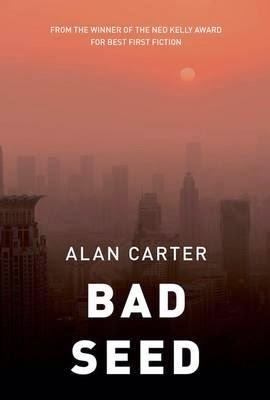 Alan Carter has created a believable cast of characters in his fictional police force, and the development of this cast in Bad Seed continues. Once in a while little things creep in which are very local, including language, and which I will now look out for when I read other crime novels set in unfamiliar cities. Having read the two previous Cato Kwong novels I looked forward to this novel with interest. The blurb led me to expect a little more of the action to be set in Shanghai, but we only briefly visited an unfamiliar Shanghai with Cato and his colleagues who were also taking in their new surroundings. The development of a number of storylines, and a number of shocks, helped to build the interest as the book progressed, although a couple of events seemed to occupy less of the narrative than they perhaps should have. Some of the tricks of writing which worked well included changes of tense, and moving from one character’s perspective to another without losing Cato’s view as the central focus. I was curious about the ‘what next ‘for a range of characters, and the outcome was plausible if a little rushed, and dissatisfying, in a satisfying kind of way which might be associated with a realistic conclusion. If you like crime fiction, and are interested in local authors I recommend a read of Bad Seed. I found myself reading at all times around the house – a good sign with me. Now that I have finished I am interested in reading more about Cato’s activities and look forward to the next instalment. – I had already met Cato Kwong but think that the book would stand alone without the need to read Prime Cut and Getting Warmer. Your mother, Megan, is clearly gifted when it comes to reviewing crime novels, Emily! Nice post! Thanks for share your good piece of content with us.